Parmigiano Reggiano Cheese, Hand Cut for sale. Buy online at Zingerman's Mail Order. Gourmet Gifts. Food Gifts. 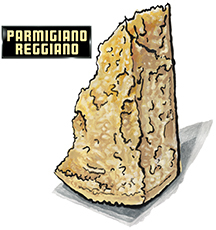 Not all Parmigiano Reggiano is the same. Not all the wheels that bear the world famous Parmigiano-Reggiano name are created equal. There are big differences from one to the next. This cheese is made by Valserena, the oldest dairy in the Parma district. It's one of the few farmstead Parmigiano Reggianos out there—all the milk comes exclusively from the Serra family's farm. Their herd is made up exclusively of rare Sola Bruna (brown) cows. This old breed makes up less than 0.5% of Italy's dairy cows (and they're only used by 4 of the more than 300 dairies that produce Parmigiano Reggiano). The vast majority of the herds are Freisians, the classic black and white dairy cows that dominate the industry. Freisians produce more milk, but the quality never matches that of the older breeds. Sola Bruna cows give milk that's particularly rich in butterfat. The cheesemaker at Valserena uses a bit more fat than the norm, which gives the cheese a richer flavor and creamier texture. Most important, the finished cheese has a wonderfully complex flavor with a lovely, long finish. There's a brightness to it that makes your mouth water, similar to what you might experience with a juicy steak. And it has none of the bitterness or mouth burn that often mars the final flavor of others. Outstanding. Our most popular cheese by a wide margin. The current wheels we're opening were made in April 2015. They have a sweet, bright, juicy acidity that's mouthwatering.